United States Capitol, Washington, D.C.: 1819 to present with the exception of July 2, 1923. Meacham, Oregon: July 2, 1923. President Warren G. Harding declared Meacham, Oregon as the nation's capitol for the day. 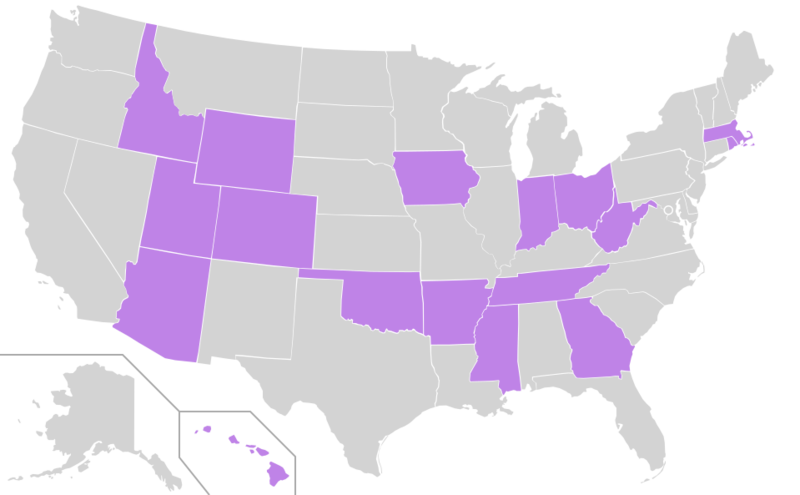 Two of the 50 U.S. states, Hawaii and Texas, were once de jure sovereign states with diplomatic recognition from the international community. Annexed by the United States in 1898, Honolulu remained the capital, first of the Teritory of Hawaii (1900–1959), and then of the state (since 1959). Annexed by the United States in 1845, Austin remains the capital of the state of Texas. ^ "For a day, Meacham was 'capital of the United States all day long'". The La Grande Observer. Retrieved 2019-04-23. ^ "Meacham re-dedicates historic marker". eastoregonian.com. Retrieved 2019-04-23. Albany ( (listen) ALL-bə-nee) is the capital of the U.S. state of New York and the seat of Albany County. Albany is located on the west bank of the Hudson River approximately 10 miles (16 km) south of its confluence with the Mohawk River and approximately 135 miles (220 km) north of New York City.Albany is known for its rich history, commerce, culture, architecture, and institutions of higher education. Albany constitutes the economic and cultural core of the Capital District of New York State, which comprises the Albany–Schenectady–Troy, NY Metropolitan Statistical Area, including the nearby cities and suburbs of Troy, Schenectady, and Saratoga Springs. With a 2013 Census-estimated population of 1.1 million the Capital District is the third-most populous metropolitan region in the state. As of the 2010 census, the population of Albany was 97,856. The area that later became Albany was settled by Dutch colonists who in 1614, built Fort Nassau for fur trading and, in 1624, built Fort Orange. In 1664, the English took over the Dutch settlements, renaming the city as Albany, in honor of the then Duke of Albany, the future James II of England and James VII of Scotland. The city was officially chartered in 1686 under English rule. It became the capital of New York in 1797 following formation of the United States. Albany is one of the oldest surviving settlements of the original British thirteen colonies, and is the longest continuously chartered city in the United States.During the late 18th century and throughout most of the 19th, Albany was a center of trade and transportation. The city lies toward the north end of the navigable Hudson River, was the original eastern terminus of the Erie Canal connecting to the Great Lakes, and was home to some of the earliest railroad systems in the world. In the 1920s, a powerful political machine controlled by the Democratic Party arose in Albany. In the latter part of the 20th century, Albany experienced a decline in its population due to urban sprawl and suburbanization; however, the New York State Legislature approved a $234 million building and renovation plan for the City in the 1990s that spurred renovation and building projects around the downtown area. In the early 21st century, Albany has experienced growth in the high-technology industry, with great strides in the nanotechnology sector. The building was completed in 1753 as the Pennsylvania State House, and served as the capitol for the Province and Commonwealth of Pennsylvania until the state capital moved to Lancaster in 1799. It became the principal meeting place of the Second Continental Congress from 1775 to 1783 and was the site of the Constitutional Convention in the summer of 1787. A convention held in Independence Hall in 1915, presided over by former US president William Howard Taft, marked the formal announcement of the formation of the League to Enforce Peace, which led to the League of Nations and eventually the United Nations. The building is part of Independence National Historical Park and is listed as a World Heritage Site. Below is a list of lists of capitals. Little Rock is the capital and most populous city of the U.S. state of Arkansas. As the county seat of Pulaski County, the city was incorporated on November 7, 1831, on the south bank of the Arkansas River close to the state's geographic center. The city derives its name from a rock formation along the river, named the "Little Rock" (French: La Petite Roche) by the French explorer Jean-Baptiste Bénard de la Harpe in the 1720s. The capital of the Arkansas Territory was moved to Little Rock from Arkansas Post in 1821. The city's population was 198,541 in 2016 according to the United States Census Bureau. The six-county Little Rock-North Little Rock-Conway, AR Metropolitan Statistical Area (MSA) is ranked 78th in terms of population in the United States with 738,344 residents according to the 2017 estimate by the United States Census Bureau.Little Rock is a cultural, economic, government, and transportation center within Arkansas and the South. Several cultural institutions are in Little Rock, such as the Arkansas Arts Center, the Arkansas Repertory Theatre, and the Arkansas Symphony Orchestra, in addition to hiking, boating, and other outdoor recreational opportunities. Little Rock's history is available through history museums, historic districts or neighborhoods like the Quapaw Quarter, and historic sites such as Little Rock Central High School. The city is the headquarters of Dillard's, Windstream Communications, Acxiom, Stephens Inc., University of Arkansas for Medical Sciences, Heifer International, the Clinton Foundation, the Rose Law Firm, and Arkansas Blue Cross and Blue Shield. Other corporations, such as Dassault Falcon Jet, LM Wind Power, Simmons Bank, Euronet Worldwide, AT&T, and Entergy have large operations in the city. State government is a large employer, with many offices downtown. Two major Interstate highways, Interstate 30 and Interstate 40, meet in Little Rock, with the Port of Little Rock serving as a shipping hub. The Oregon State Capitol is the building housing the state legislature and the offices of the governor, secretary of state, and treasurer of the U.S. state of Oregon. It is located in the state capital, Salem. Constructed from 1936 to 1938 and expanded in 1977, the current building is the third to house the Oregon state government in Salem. The first two capitols in Salem were destroyed by fire, one in 1855 and the other in 1935. New York architects Trowbridge & Livingston conceived the current structure's Art Deco stripped classical design in association with Francis Keally. Much of the interior and exterior is made of marble. The Oregon State Capitol was placed on the National Register of Historic Places on June 29, 1988. The federal government's Public Works Administration partially financed construction which was completed during the Great Depression in 1938. The building was erected at a cost of $2.5 million for the central portion of the building, which includes a dome of 166 feet (51 m). The wings, which doubled the floor space of the building to about 233,750 square feet (21,716 m2), were added later for $12.5 million. The grounds outside the capitol building contain artwork, fountains, and flora, including the state tree (Douglas fir) and state flower (Oregon grape). Raleigh (; RAH-lee) is the capital of the state of North Carolina and the seat of Wake County in the United States. Raleigh is the second-largest city in the state, after Charlotte. Raleigh is known as the "City of Oaks" for its many oak trees, which line the streets in the heart of the city. The city covers a land area of 142.8 square miles (370 km2). The U.S. Census Bureau estimated the city's population as 479,332 as of July 1, 2018. It is one of the fastest-growing cities in the country. The city of Raleigh is named after Sir Walter Raleigh, who established the lost Roanoke Colony in present-day Dare County. Shawnee Methodist Mission was established by missionaries in 1830 in Turner, Kansas to minister to the Shawnee tribe of Native Americans who had been removed to Kansas. In 1839 the mission relocated to Fairway, where it built a brick building referred to by names varying from Shawnee Indian Methodist Manual Labor School. It was one of the first such missions established in the territory acquired by the United States in the Louisiana Purchase. Designated as a National Historic Landmark in 1968, the Shawnee Methodist Mission is operated today as a museum. The site is administered by the Kansas Historical Society as the Shawnee Indian Mission State Historic Site. The Shawnee Methodist Mission served briefly as the second capital of the Kansas Territory, when the legislature was controlled by pro-slavery advocates, holding that designation from July 16 to August 7, 1855. The Shawnee Methodist Mission is the origin of the Shawnee Mission name used by the United States Postal Service to refer to the Kansas City Metropolitan Area suburban communities in northeastern Johnson County. The Shawnee Mission School District serves those communities. Windsor is a town in Windsor County, Vermont, United States. As the "Birthplace of Vermont", the town is where the Constitution of Vermont was adopted in 1777, thus marking the founding of the Vermont Republic—a sovereign state until 1791 when Vermont joined the United States. Over much of its history, Windsor was home to a variety of manufacturing enterprises. The population was 3,553 at the 2010 census.